This book,' Layout for Different Sacrifices according to Different Sulbasutras' is a companion volume of the earlier published book 'Layout and construction of Citis according to Baudhayanam, Manava and Apastamba Sulbasstras, by the same author. 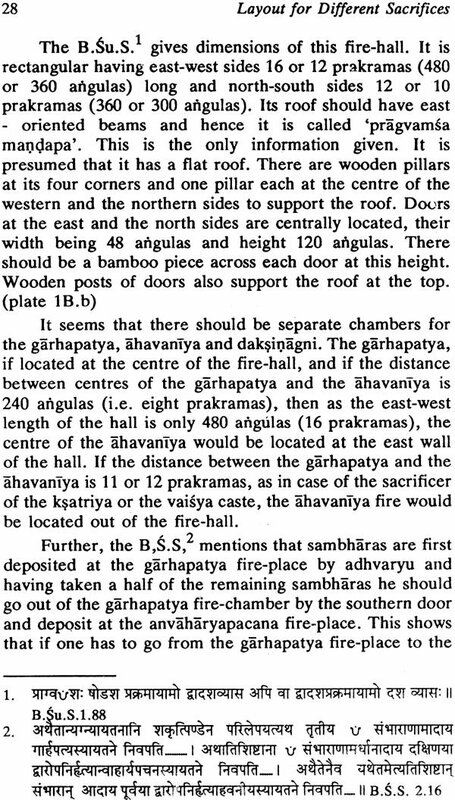 The book gives in detail layout of fire-places, vedis, pavilions, etc., required for different sacrifices namely Darsapurnamasau, Caturmasya, Nirudha Pasubandha, Soma, Soma with a citi, and Sautramani, according to four Acaryas, Baudhayana, Manva, Apastamba and Katyayana, a number of detailed dimensioned figures explaining the text are included. References to relevant quotes are given for each statement made regarding layouts. i. Cara Sulbasutre - Translation in Marathi of Sulbsutras by Baudhayana, Manava, Apastamba and Katyayana. ii. 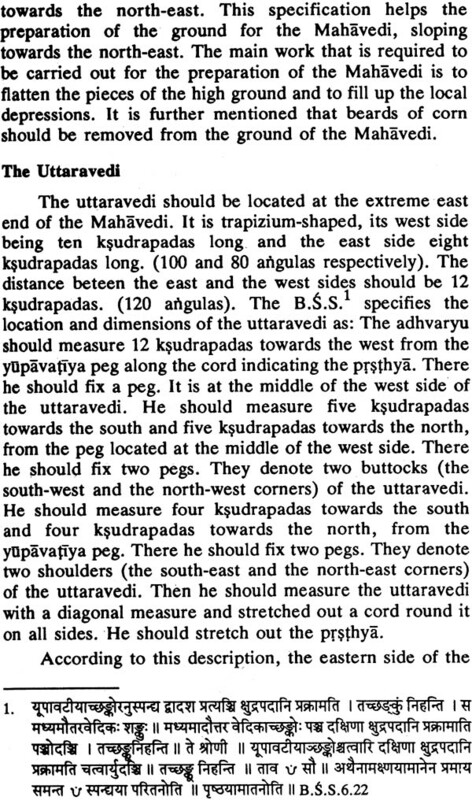 Geometry according to Sulbasutra - Derivations of different geometrical theoroms, formulae, etc., given in the sulbasutras, by different scholars as well as his own contribution, are presented. iii. 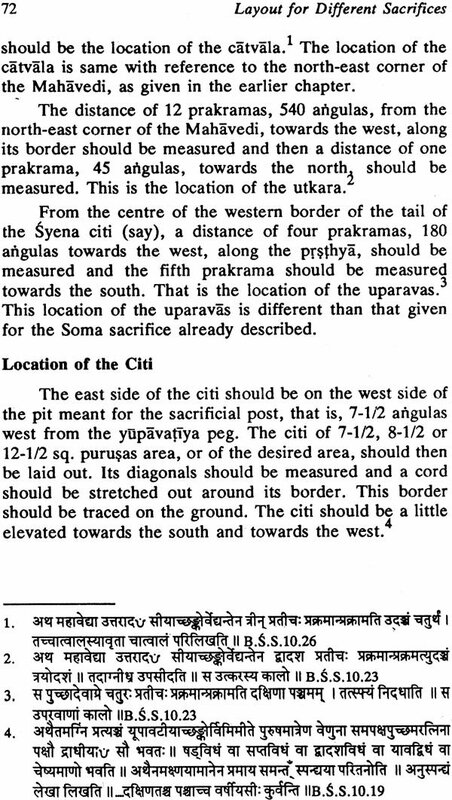 Layout and Construction of Citis according to Baudhayana, Manava, and Apastamba Sulbasutras - The present volume is companion of this volume. Sulbasutras which are one of the chapters of Srautasutras, give information about methods of giving layout of pavilions, vedis, fire-places, etc., that are required for different kinds of sacrifices. They include knowledge of the basic geometry essential for understanding the principles behind the procedures of giving layout. To give a layout of any structure, from a hut to a five-star hotel, requires knowledge of surveying. But surveying is essentially an engineer's job and hence I undertook the study of sulbasntras as part of my study of the History of Indian Engineering and Technology. When I came across these sulbasutras I was very favourably impressed. 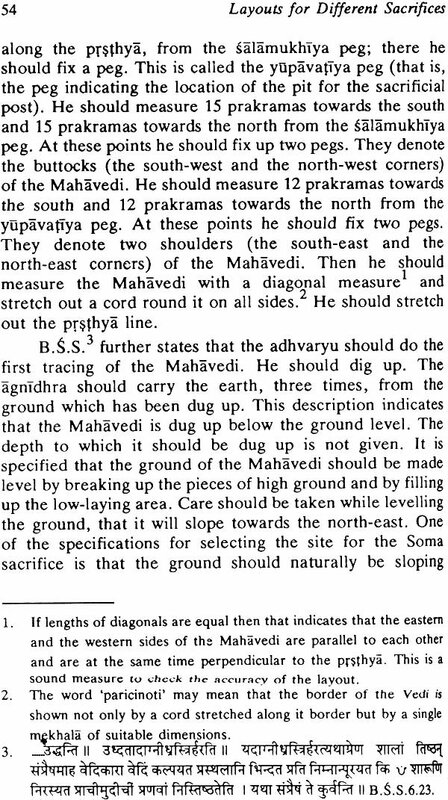 The methods of giving layout for different sacrifices, recommended by acaryas are so accurate and flawless, that even now one has to follow these methods. 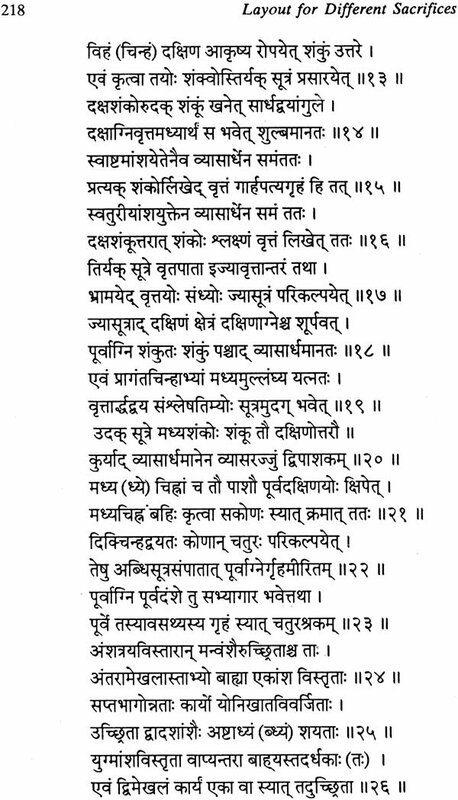 I have, therefore, studied these sulbasntras, although I do not claim scholarship either in the Sanskrit language or the geometry. These sulbasntras, in addition, give information of giving layout and construction of citis of different shapes. I have written a book,' 'Layout and Construction of Citis according to Baudhayana, Manava and Apastamba Sulbasutras'. The present book is its companion volume. These two books together cover almost all the aspects of giving layout and construction of different appertainances of various sacrifices according to the four eminent ancient acaryas, Baudhayana, Manava, Apastamba and Katyayana, Chronologically, Baudhayana is said to be the earliest of these acaryas, But the information of geometry and different methods of layout given by him could not be surpassed by the later acaryas. His thorough knowledge of the principles of geometry and the accumen in its application for giving layout as well as the scientific presentation, are admirable and praiseworthy. On the basis of the information of layout for different sacrifices as recommended by different acaryas, I have prepared drawings, names of these sacrifices being Darsapurnamasau, Caturmasya, Nirudha Pasubandha, Soma, Soma with a citi, and Sautramani, In order to check my interpretations of these sulbasntras, I have shown these drawings to Prof. C.G. Kashikar, an authority on Vedas and particularly on Srautasutras. He very kindly spared his valuable time to go through these drawings, one by one, and approved them. I am very much grateful to him. I am thankful to the Ministry of Human resources and Development, New Delhi, as it has recommended this book to the Maharshi Sandipani Rashtriya Vedavidya Pratishthanam, Ujjain, for the publication of this book. I wish to thank Shri M.C. Jain, Consultant (ACD), Maharshi Sandipani Rashtriya Vadavidya Pratishthanam, for undertaking, with zest, the task of getting the approval of the Project Committe of the Maharshi Sandipani Rashtriya Vedavidya Pratishthanam, Ujjain and then getting it printed and published. The fundamental conceptions of sacrifice go back to Indo-European antiquities though the traces are rather faint. But it is quite clear that the cult of the sacrifice had been much developed in the Indo-Iranian period. There is a very striking resemblance between the Vedic Agnistoma and the Homa ceremony of the Parsis. 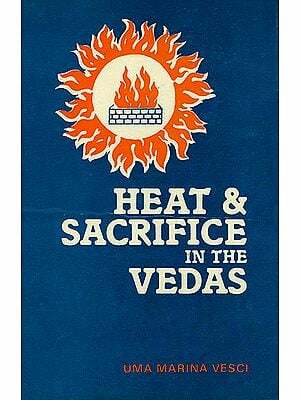 There are numerous words indicative of the cult of the sacrifice both in the Vedic language and in the ancient Parsi religious books. 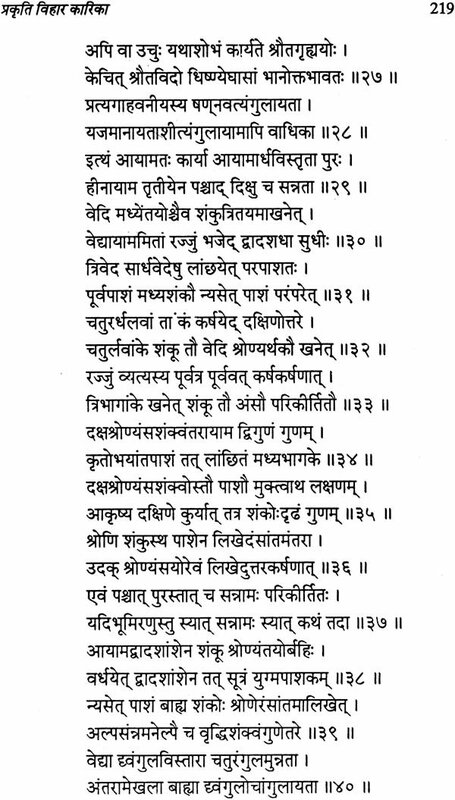 For example, words like atharvan, ahuti, uktha, barhis, mantra, yajna, soma, savana, stoma, hotr do also occur in the ancient Parsi religious scriptures. The Srauta sutras contain a very detailed, meticulously accurate and vivid description of the several sacrifices that were performed in ancient times. These works were manuals compiled for the practical purpose of giving directions to those who are engaged in such sacrifices. They are based on ancient Brahmana texts, which they quote at every step, many individual sutras being couched in the very language of the Brahmanas, and on actual practice and only bring together what was in vogue. 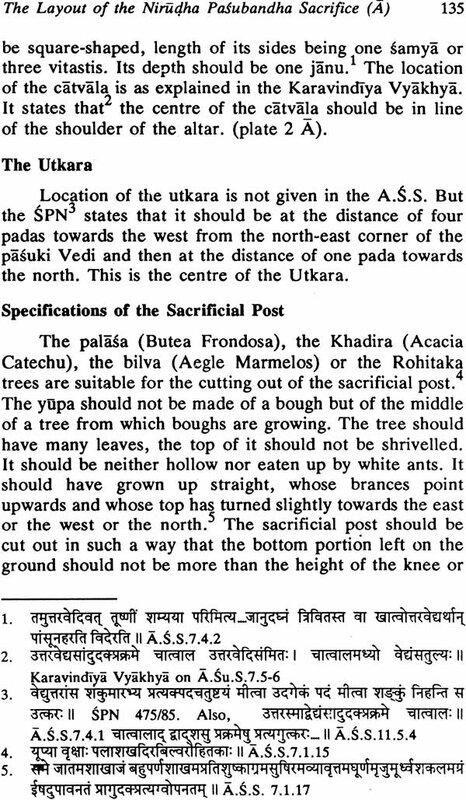 For a reader who may not have any idea of Srauta sacrifices, a brief sketch of only those sacrifices of which layouts are described is given below. 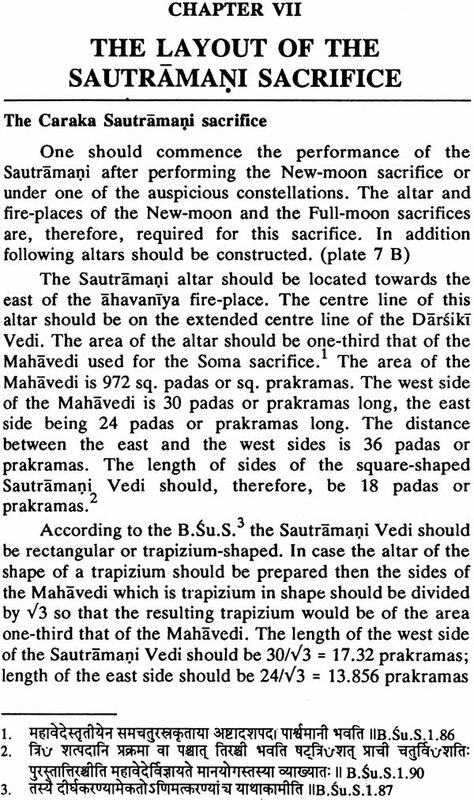 The New-moon and the Full-moon sacrifices is the pattern or archtype (prakrti) of all other istis (which are called vikrtis or modifications). Darsa means 'the day on which the moon is seen only by the sun and by no one else'. It is 'the day when the sun and the moon dwell or are together'. Paurnamasi is 'the tithi on which the sun and the moon are at the greatest distance from each other'. Four priests, the adhvaryu, brahma, hotr and agnidhra are employed for this isti, An isti means a sacrifice in which the sacrificer employs four priests. The Caturmasyas are four, viz. Vaisvadeva, Varunapraghasa, Sakamedha and Sunasiriya. Each of these is called a parvan (part or joint) of the Carurmasyas. They are called Caturmasyas because each of them takes place after four months. They are performed respectively on the Full-moon days of Phalguna (or Caitra), of Asadha, Kartika and on the fifth full moon day from the day on which the Sakamedha is performed (i.e. on Phalguni) or two or three days before it. They indicate the advent of three seasons, viz. vasanta (spring), varsa (rain) and hemanta (autumn). If the Vaisvadeva-parvan is performed on Caitra Full-moon, then the Varunapraghasas and Sakamedhas will be performed on Sravana and Margasirsa Full-moon days respectively. The S.P. Br. gives a fanciful etymology of the word Varunapraghasa. Yavas (barley grains) belong to Varuna and as these are eaten (from ghas to eat) in this rite it is called Varunapraghasa. 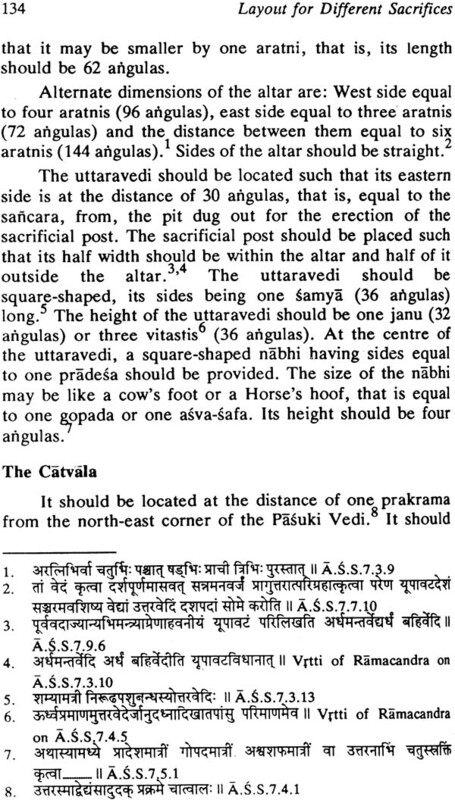 Two altars (vedis) have to be prepared to the east of the ahavaniya in line towards the east, one south of the other. The northern altar is in charge of the adhvaryu and the southern one in charge of his assistant, the pratiprasthatr. For this sacrifice five priests are required; the adhvaryu, brahma, hotr, agnidhra and pratiprasthatr. The Sakamedha literally means 'kindling along with or at the same as' (sakam edha). The name is probably given because the first offering in it is a cake on eight potsherds offered to Agni Anikvat with the rising sun. In the Sunasiriya the special offerings are a cake on twelve potsherds to Sunasirau (Vayu and Aditya or to Indra Sunasira), an oblation of fresh warm milk (not heated) direct from the cow to Vayu, a cake on one potsherd to Surya. There is no uttaravedi in this rite. This is an independent sacrifice and it is also performed in Soma sacrifice as a constituent part. The independent sacrifice is called nirudhapasubandha (offering of an eviscered animal) and the subordinate ones are called saurnika. The independent animal sacrifice is to be performed every six months or every year by the ahitagni throughout his life. If done once, in a year it was to be performed in the rainy season (i.e. in Sravana or Bhadrapada) on New-moon or Full-moon day or if done six monthly then at the beginning of the southern and the northern passages of the sun (daksinayana and uttarayana). In this sacrifice there is a sixth priest called Maitravaruna (or Prasastr) in addition to the five required in the Caturmasyas. THE LAYOUT OF FIRE-PLACES AND THE ALTAR OF THE NEW - MOON AND THE FULL-MOON SACRIFICES. THE LAYOUT OF FIRE-PLACES AND THE ALTAR OF THE NEW-MOON AND THE FULL-MOON SACRIFICES. THE LAYOUT OF THE SOMA SACRIFICE WITH THE CITI. THE LAYOUT OF FIRE-PLACES, THE ALTAR AND THE FIRE-HALL OF THE NEW-MOON AND THE FULL-MOON SACRIFICES. 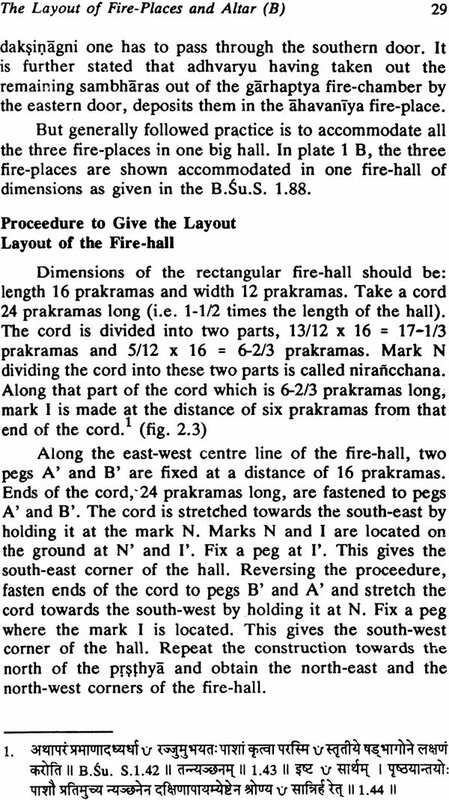 THE LAYOUT OF FIRE-PLACES, THE DARSIKI VEDI AND THE FIRE-HALL OF THE NEW-MOON AND THE FULL-MOON SACRIFICES.